I've been to the <?xml:namespace prefix = st1 ns = "urn:schemas-microsoft-com:office:smarttags" />U.S. for close to twenty years. I've seen many things, experienced many stuffs and still I feel like I am running in a circle. In another word, I am no better than I was before from back in Laos. Worse yet, in some ways, I am going down with no redeeming hope left whatsoever. What is happening to me? It is not that I have no education, in fact far from it. Or, maybe, I have no human relationship or social networking? I would say it is partly right but it is not the main cause of my dilemma - my angst. It must be something much deeper, much fundamental than what meets the eyes and senses with the thought. Ask yourself: how much do you put into the relationship business? How extensive have you been networking? Sharp, correct or 1 is 1 not two or even 1.0001. You do what you say. No complaint, no excuses. That is the way to build yourself up for success. Always ask yourself: do I have the necessary discipline to get the job done? With my own experience, I would say this formula is THE WAY to go in this highly competitive world. Of course, I will try to implement it, make it my way of life given everything I have at my disposal or lack of disposal. Yet, since I am a thinker, I can see that even if I make lots of money and/or become a darling of the public; it won't come close to addressing the plight of my soul - my once-in-a-lifetime existence. Of course, the wealth and the public image will uplift my ego which not a few of us will stop at that but not me. I think, as a human being, we should demand more from ourselves or this life is a waste for a garbage is still a garbage though wrapped in an elegant outfit. From Buddhism, I learn that we are all born with a Buddha nature. That is to say, each single one of us has a capacity to be enlightened not in other lifetimes but this very lifetime. What keeps us from realizing this potential is our ignorance subtly hidden under the many layers of our sophistication, our persona and our way of life dictated by the life conditions in the modern world. Ajarn Buddhadasa, the foremost thinker of this century, neatly caps the Buddha nature as 'calm, cool and clear'. The first can be derived from being unperturbed like the image of the mountain in the midst of the windstorm. The second can be extracted from being non-attached to anything like the image of a dewdrop on the surface of the lotus petal. The last one can de screened from being empty or Sunyata like the image of a zero or a complete circle. That is the way the real Panya is originated. To really put it in the most succinct term, it will be 'TO BE AWAKE' or 'mindfulness'. For my own sake, I will say that Buddha nature can only be manifested when I have the Sinh (discipline), Samadhi (meditation) and Panya (intellect/wisdom). Though placing at the last, Panya guides the two and the key to what our existence is. Also, the message by Hermann Hesse in his famous novel 'Siddhartha' aptly captures the way to Buddhahood: 'I know how to think, to wait and to fast.' That is to say in order to think rightly, it requires the service of Panya. The same goes with the second, it requires the discipline knowing when to act and when to stay still. And lastly, to fast, it means meditation. In another, with fasting, you can go on in this world with less material needs - a crucial element in the ability to see through what your real needs are. From Tao, I learn that the Tao that can be manifested is not the real Tao. In another word, since our senses are quite limited in their capacities, the truth or the true nature of anything can't be grasped or perceived. The most the truth can be revealed is by its signpost or hint like a finger pointing at the moon. So, if you take the finger (the manifestation) to be the truth, pure and simple you will never see the moon (the truth). For my own sake, I will put it this way. Language is so conditioned by the rules and constructs that the most we can get is the approximation of the real thing (truth) so if you want to find the real thing, step outside the realm of language and experience the real thing with all your being. What is fascinating about Tao is its natural course or wu-wei (doing without doing). Left alone (with Panya, of course), grass will grow and things will be taken care of. One thing I like the most about Tao is its subtlety that defies our seemingly common sense. An image of the watercourse will perfectly capture what Tao is. That is to say if you just observe the way the water flows between the towering rocks with the least resistance, how it settles in the lowest region at ease, you will know that life in its ultimate nature is not a struggle but a celebration. After all, we already have everything that we are frantically searching for. Why not relax and go with the flow, instead? From the Judaic-Christian/Greek/Roman tradition, though in themselves is quite a mess, I would say that this is the way the modern world is built upon. Yes, in some ways, it is of the old past but its influence pervades every nook and canny of our thinking and way of life. To nail down each of the three distinctive strands, her is my preliminary attempt. With Judaic-Christianity, we are always thinking of the one, the ultimate. In another word, nothing will do until our way is the only way - the true way, the right way. With Greek legacy, we are aiming at perfection in every realm not just artistry, intellect, but body as well. Here, the intellect plays a key role for it is the only way to the truth. With Roman legacy, we are emphasizing practicality. In another word, heaven is nowhere but here. Let others play with their eccentricity but we will go with what works. From the scientific and power-oriented Westernized worldview, this world is nothing but a big experiment. That is to say if you want a certain effect, you come up with a certain cause. So, given the deterministic nature, you control the experiment, play with the quirk and anomaly so that nothing can in any way surprise you. In another word, life becomes regimented that free will is but a joke as is democracy. The way everything is structured you couldn't help but feels the effect of power weighing down on you. This is especially true when you try to break out of its grip and causes a meaningful change, not just a cosmetic one. Here, in this worldview, you either become the lucky few being showered with all the amenities of life or the disposable majority always at the whim of the power-that-be. What is so effective about this worldview is that everyone buys into it for its reward is so enticing. Who doesn't want the luxury of life surrounded with wealth, gadgets and beautiful bodies? I guess I do too. My point is how do I get the best of both worlds while still retaining my roots, my soul? Maybe, I can have the answer when I finally find out who I really am and what I really want in this life. I will say that it depends on the way you look at things. That it is the law of karma. That is the law of my own action. Will I be down on myself. What is mine to begin with. Who cares if I fail? 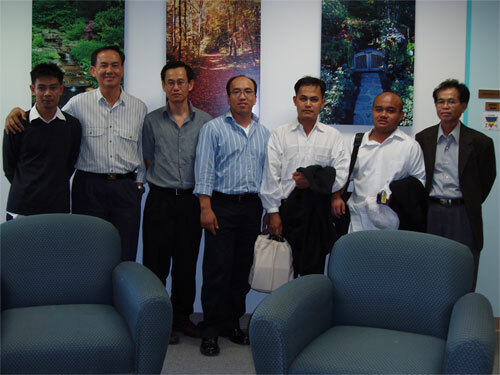 Last weekend (10/1/04-10/2/04), I went down to the University of California for the first Lao think tank meeting. I would say that it was a very good one. We discussed about the nation, the religion, the education and the new society. At this point, I couldn't disclose anything - just the group picture shown at the top of the page. Hopefully, in the near future, I will be able to share the discussion with you all. p.s. Group pix: from left to right: Souk, Ai Prany, me (Kongkeo), Phoumy, Thanong, Phonexay & Ajarn Xay.